Our one and only resident twitter reviewer Tim Schilling is back with a look at the vampire classic “The Lost Boys.” One of the first “MTV style” horror movies some have slammed the film for being a case of style over substance. Nonetheless, the film was a huge hit on initial release taking in nearly $40 million and has remained a popular horror movie to this day. Let’s see if Tim’s stab at the film turns him into a fan of vampire flicks. 0:05 This movie already has an advantage of being made in the 80’s. I’m a sucker for a good 80’s movie. 0:09 Read the tv guide, you don’t need a tv! Perfect sense. 0:22 I swear the mother in this movie is smoking something. 0:32 I don’t understand what these vampires are trying to do. Hanging from a bridge? 0:37 I should keep count how many times they said Michael/Mike in this movie. It’s literally every other word. 0:40 You wait until mom finds out you’re a vampire! 0:51 Yup the mom is definitely on something. 0:58 This is such an awkward dinner. 1:01 These vampires are straight up hooligans. 1:14 I want everyone in the town to end up being vampires at the end. 1:29 I knew he was the head vampire. I knew it when he asked to be invited in the house. 1:30 I bet the mom is thinking she’s having a bad trip right now. Pretty much loved #TheLostBoys. So corny but smart with tons of horror references at the same time. Great story and music. Not sure if it was supposed to be funny but I got a bunch of laughs out of it. Definitely one of my favorite vampire movies now. 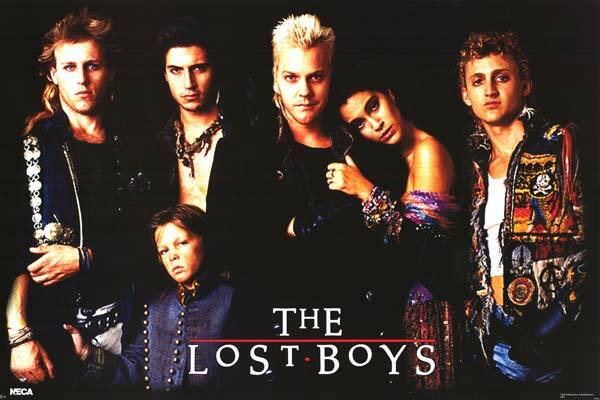 When I am in a mood for a horror/teen/comedy movie I always consider Joel Schumacher’s The Lost Boys as one of my top 5 choices. First of all I love the cast. I find the appearance of Dianne Wiest amazing as the mother of Jason Patric and Corey Haim. She proves that she can manage with success every role she plays. I also find Kiefer Sutherland very good at his role as the leader vampire. Last but not least the grand father Barnard Hughes has a small part in the movie but a very special and funny one. A divorced mother with her two sons moves in a small town to live in a house with her old father. There something strange is going on. Flyers with missing persons are everywhere. Gangs and restless people creating troubles all the time and make local people’e life miserable. 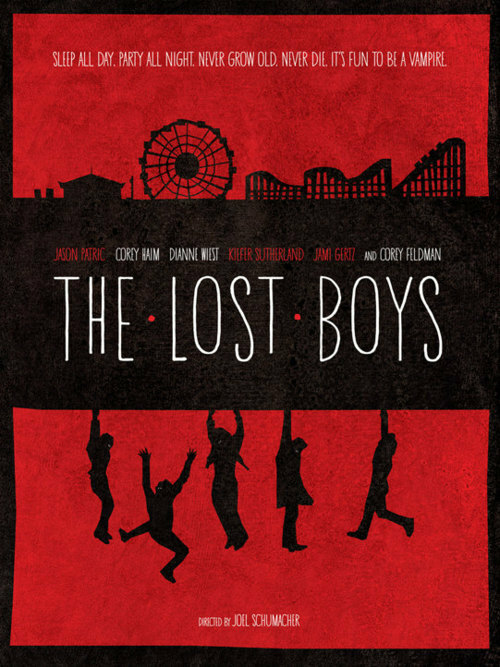 The young boys discover the dark secret of the town with a very bad way. The oldest becomes a member of the most dangerous and vicious gang without his will. His younger brother try to help him as much as he can but things keeps getting worse and worse. Their mother doesn’t seem to understand the danger for herself and for her 2 sons even though the signs are everywhere. I won’t say more because I don’t want to be a spoiler for those who haven’t seen it yet, even though I hope there aren’t too many.